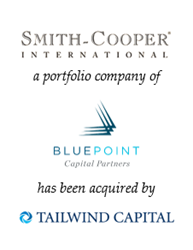 BlackArch Partners (“BlackArch”) is pleased to announce the sale of Smith-Cooper International (“Smith-Cooper” or the “Company”), a portfolio company of Blue Point Capital Partners, to Tailwind Capital (“Tailwind”). Smith-Cooper, headquartered in Commerce, CA, is a next-generation, global industrial distribution platform, serving a diverse range of end markets that include industrial, fire protection, oil and gas, commercial and residential construction, agriculture, food and chemical processing and waterworks. The Company’s unique design-and-import model allows Smith-Cooper to aggregate demand across its various markets and to serve as a critical link between a fragmented base of 60+ vendors and a highly localized group of 4,000+ distributor customers. Smith-Cooper offers products through three highly regarded and proprietary brands: SCI®, Sharpe® and FPPI®. The Company’s diverse offering of more than 15,000 SKUs, along with its ability to deliver unparalleled service levels and efficient inventory management for its customers, positions Smith-Cooper as the industrial distribution platform of choice. BlackArch was retained by Blue Point Capital Partners to serve as its exclusive financial advisor. The transaction continues BlackArch’s strong presence in the distribution, business services and diversified industrials sectors and is representative of the firm’s focus on providing unique M&A advisory services to market-leading growth businesses. Smith-Cooper International is a value-added designer, producer, importer and distributor of branded valves and fittings under the SCI®, Sharpe® and FPPI® brands. Headquartered in Commerce, CA, with locations in Elk Grove Village, IL, Lawrenceville, GA, and Vancouver, WA, the Company provides more than 15,000 SKUs to more than 4,000 localized distributor customers across diverse end markets. Smith-Cooper is an established brand that offers the quality of a domestic product at a better value through an established import supply chain; customers include national and regional diversified distributors serving a variety of end markets and geographic areas. Tailwind Capital is a leading middle market private equity firm focused on growth-oriented investments in targeted sectors within healthcare, business and industrial services. Tailwind partners with experienced management teams and entrepreneurs to transform businesses through organic growth initiatives, acquisitions, and operational and strategic improvements. Since inception, Tailwind has over $3 billion of committed equity capital, and invested in 35 portfolio companies and over 55 add-on acquisitions.